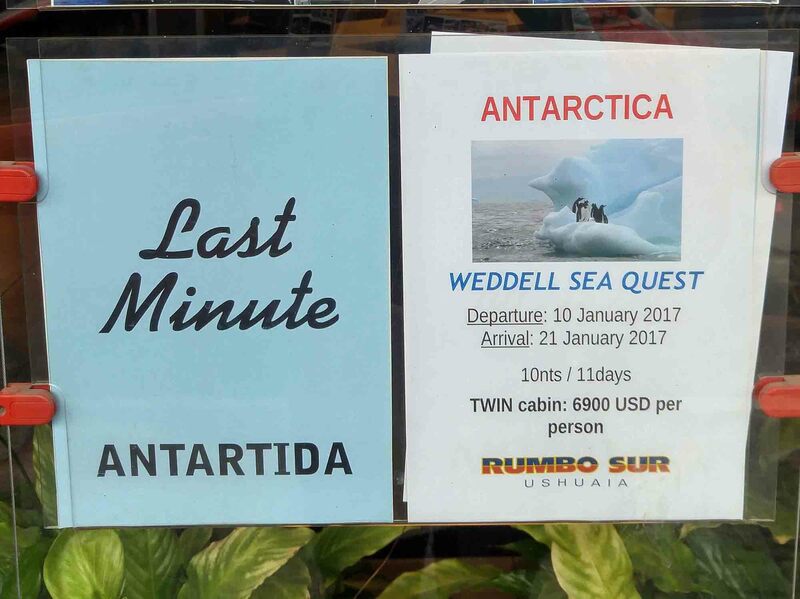 It’s a rumour you hear about but are never sure if it’s true: can you book a last minute cruise to Antarctica and save thousands? While in Ushuaia for my own Antarctica cruise (not booked last minute), I asked around at hostels, hotels and travel agencies about deals. 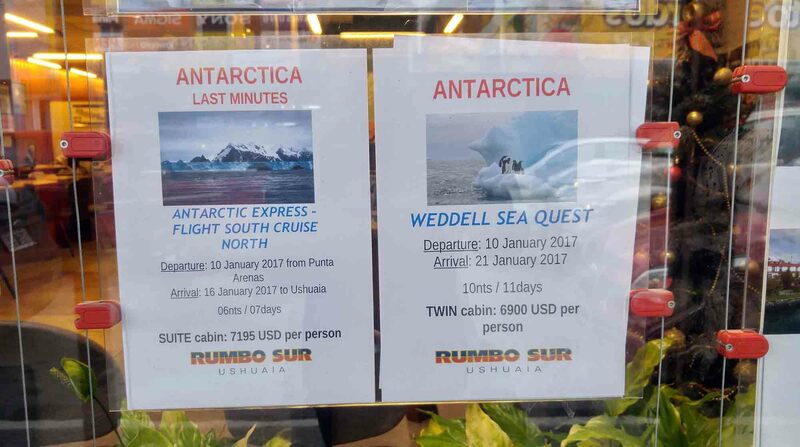 I didn’t need to look too hard because the moment I walked into my accommodation, I noticed a printed flyer with the current Antarctica cruise deals posted up in plain view. In fact, they were all over town. 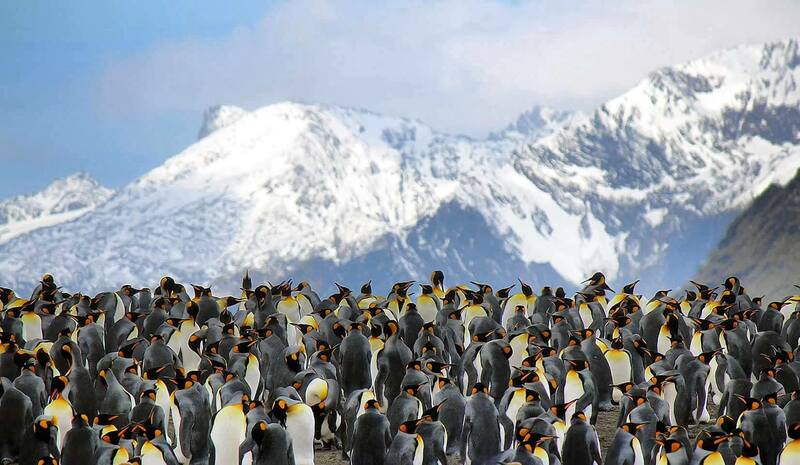 Show up to Punta Arenas, Chile or Ushuaia, Argentina and you’ll save thousands of dollars by paying for a last minute cruise. But it’s not necessarily as simple as it sounds and you need to consider a few things. Depending on the expedition course itinerary, you can save upwards of 50% if you book last minute. I asked around on my cruise to see if there were travellers who had booked within the last few days or weeks. There were. The listed price of the cheapest cabin on my ship was $16, 495 USD – for a triple share berth. Several people on board One Ocean Expedition‘s Akademik Ioffe snagged a last minute deal for $8, 900 USD, booked with a travel agency in Ushuaia. It’s still expensive, but that’s almost half price (46% off!) for a 19-day expedition through the Falkland Islands, South Georgia and the Antarctic Peninsula. **Hot Tip: The most expensive Antarctic cruises – or the most expensive berths on a ship – are more likely to offer a bigger discount. The triple or quad share cabins don’t go on sale as often but you may be able to snag a twin room for the same price of a triple or quad share. 1. The price is discounted by several thousand dollars – depending on the type of cruise you’re interested in and the length of time. 2. Companies often offer bonus deals like a jacket you can keep or a book on the local wildlife. 3. You may get lucky and land an empty cabin to yourself. If the ship doesn’t completely fill up you might have a room to yourself or one other roommate rather than two! There is no way of knowing how it will work out, it’s completely based on luck. 1. You need to have some major flexibility in your schedule. I would not recommend this for anyone who is on a timeline and needs to be back to work on a certain date or catch a flight out. This is ideal for long-term travellers who can be flexible and wait for the right trip on the right days. 2. Cruise options are limited – particularly in high season. If you plan on going to Antarctica in December or January be aware that this is the peak of high season for cruises. The likelihood of getting a spot on the ship is smaller than if you plan to travel in November, February or early March. 3. Not all options are available. If you had your heart set on kayaking or winter camping, the last minute deals may no longer have availability for these extra activities or the ship may not offer them at all. 5. Consider the extra cost to “hanging” around and waiting for the right cruise discount to show up. It could take days or even weeks for the perfect availability. Consider how much accommodation, food and entertainment will cost while you’re waiting. 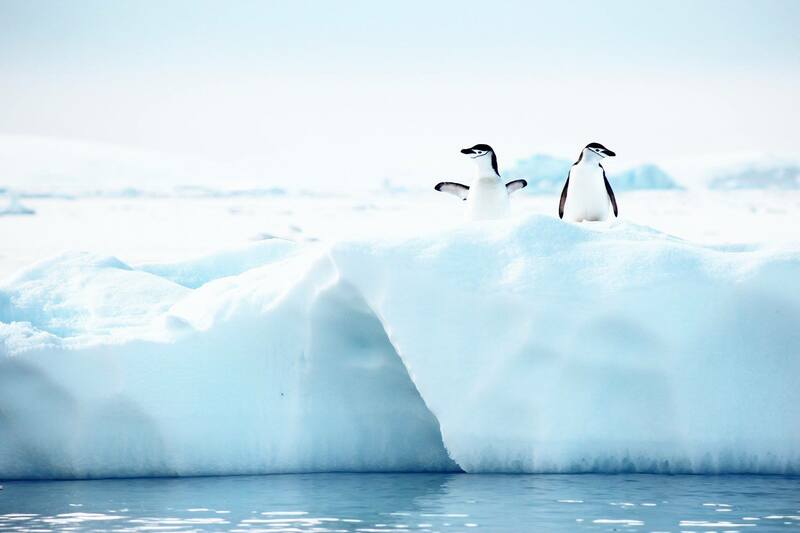 It will dip into the savings you have set aside for an Antarctic cruise. How do you book a last minute cruise? How it works: Travel agencies get the leftover berths from the ship operators 10 days to two weeks before sailing. The price is set by the operator – there is no room for negotiating a deeper deal (I tried). These leftover spaces are offered to people waiting in Ushuaia or Punta Arenas or anyone travelling around Patagonia. The cheapest and most readily available deals are usually in November. Then prices peak in high season from Christmas through January departures. January is the highest month of the Antarctic season with hatching penguin chicks, long days and whales arriving from their migration. Waiting is common. February and March are excellent for whale watching and deals are more likely to occur. The easiest way is to show up to Punta Arenas or Ushuaia and shop around. They are small cities and the tourist centre is easy to get around and ask around to find the deals. 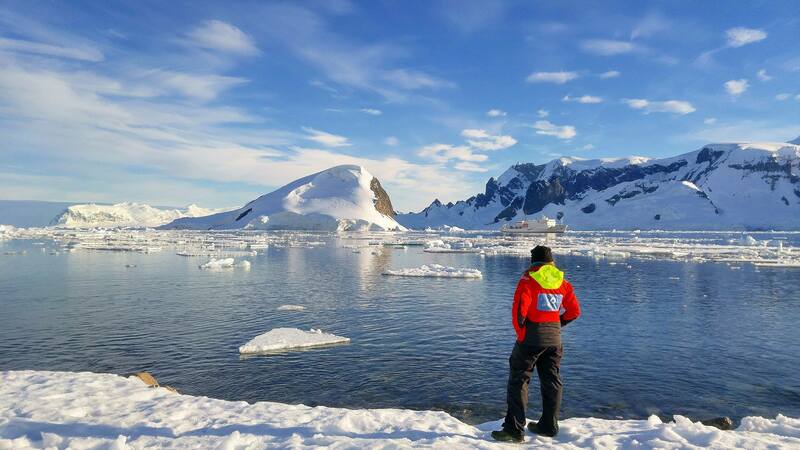 Antarctic expedition companies release their last minute prices to travel agents so your best bet is booking with an agent. A second option is to reach out to a travel agency through e-mail about their last minute deals. They will send you a listing of options, dates, prices and voyage itineraries. My friend Meg, from Travelher, recently did. She was in Chile, planned to travel in February, had flexibility in her schedule and could choose from 6 options e-mailed to her for an Antarctic cruise. She travelled out of Punta Arenas by airplane to save time on the two-day crossing over the notorious Drake Passage. Her trip was discounted by 40%. The original price was $10, 895 USD and she landed it for $6, 595 USD. This was the best option on the listing based on destinations, boat and price. What if you can’t book last minute? 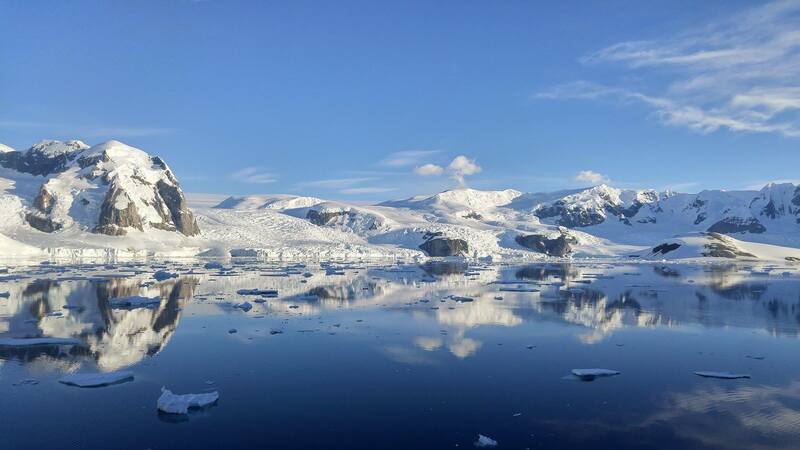 Don’t worry – there are still ways to land discounted Antarctica cruises! If you don’t have the flexibility necessary to book a last minute cruise while waiting around South America, consider signing up for travel reports or expedition companies’ e-mail newsletters. A month or two before the season gets underway, companies attempt to sell their available berths for deep discounts. 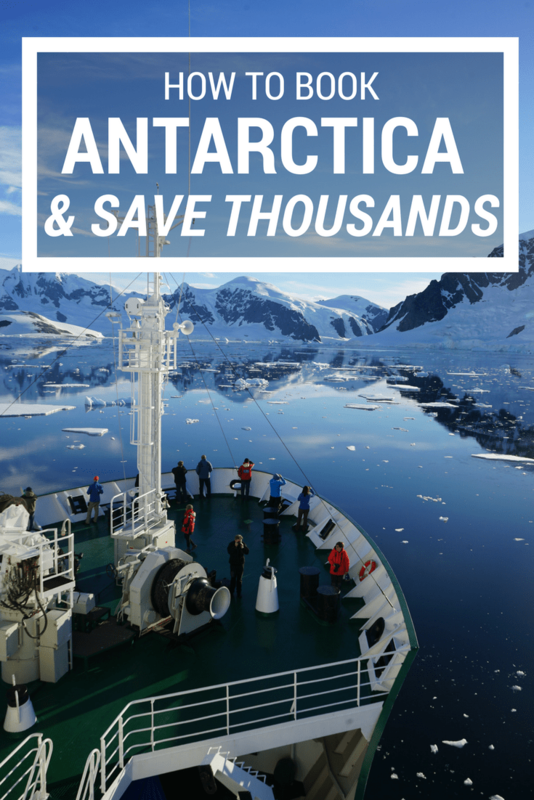 In September, I received a travel e-mail announcing a price reduction for Antarctic cruises. Most deals were only on twin rooms. They generally worked out to be the same price as a triple-share. It’s a benefit if you’re looking to have a private room for cheaper prices rather than the cheapest cruise available. The flash sale I watched was for only three days and berths went quickly. You have to be prepared to act fast if you get one of these e-mails. I was thisclose to booking a 10-day cruise to the Antarctic peninsula in a twin room for $7000 CAD. I declined last minute as it just didn’t feel right and didn’t offer the types of activities I wanted. It’s important to know what you are willing to give up – or not – while booking a trip. As an adventure traveller, I needed an activity like camping, scuba diving, or kayaking or the ability to see more places like South Georgia or the Falklands. The cruise I declined would only take me to Antarctica, kayaking was already sold out and the other two activities weren’t offered (or the cruise was still out of my price range). The wasn’t something I was willing to drop so much money on and be disappointed that I didn’t get the experience I had dreamed about. Consider signing up for Oceanwide Expeditions, Quark Expeditions, or with my personal suggestion of One Ocean Expeditions (the company I went with). Do you have any other questions about landing a last minute cruise to Antarctica? I spent hours of researching and figuring it out myself, so feel free to ask them in the comments below and I’ll answer them! Hi Ashley, Its great that you had the experience of the 7th continent.. I am planning to do the trip this year end around SEP-NOV.. I wanted to try out the last minute deal.. However I wanted to check about the any fraud agency or travel agents that might cause any issues.. How should we proceed in paying the money to them ??? Do we get any confirmation that our bookings are confirmed after we pay ? Hi Saran! Thanks for the message. I would recommend finding the deals and seeing which company they are through, then booking directly through the company if they’ll match the price (I’m assuming they will). If not, research the third party you would be booking through, read reviews, and try speak with someone over the phone if possible (rather than through e-mail). If also possible, pay using your credit card so you have purchase insurance on the trip. Hopefully that’s helpful! Hey Ashlyn–this was super helpful. Unfortunately I don’t have the flexibility to snag an in-person deal. I’m looking at an adventure option for $7,300 for a quad. 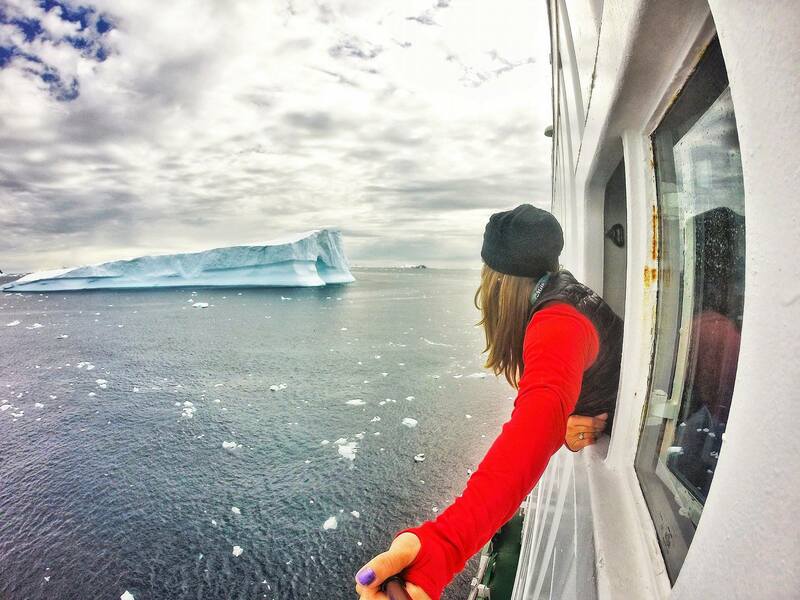 I am okay with sharing a room–it’s just the Antarctic experience that I care about. Kayaking, camping and other excursions are included, but diving isn’t (dangit). This is probably something I’ll only do ONCE, so how do I know I’m not missing any sights that are important? I really want to see leopard and elephant seals and whales. The trip is in March. Any guidance is greatly appreciated. Adventure and apex predators at a great price is what I’m after (aren’t we all)! I had no idea that cruises would be so discounted! It’s amazing just how much they will take off the price just to fill the spaces. I think a last minute deal would be my option as I could never afford $10k but right now they are all a pipe dream. But one day! Wow really useful information. I really want to go to Antartic one day and this has made me think about what options I have available. I really want to go on a smaller boat, although I do suffer from sea sickness so don’t know if I should be a bigger boat because of this. Wow insightful sharing. Didn’t know. Great guide! Awesome tips and hopefully well be able to save on a last minute cruise sometime! Even though its expensive, it sounds amazing! WOW that’s so much money you can save! Travelling to Patagonia is one of my biggest dreams and it would be even more amazing to go on a cruise to Antarctica as well <3 Thanks for all these tips! Pure gold!! Do you think early December would still be more difficult to get on a ship this way? Thank you for writing this!!! I’m going to share it with my friend! This is exactly what we were thinking of doing, but weren’t sure how it was going to play out. This is so amazing! I would love to do something like this! Such a great guide. I wish we had the spare $$$ to do this when we go to Sth America. What an informative post! Travelling to Antartica seems possible now! Bookmarking it! Hot damn. I wish i could afford to blow $6k on a cruise. 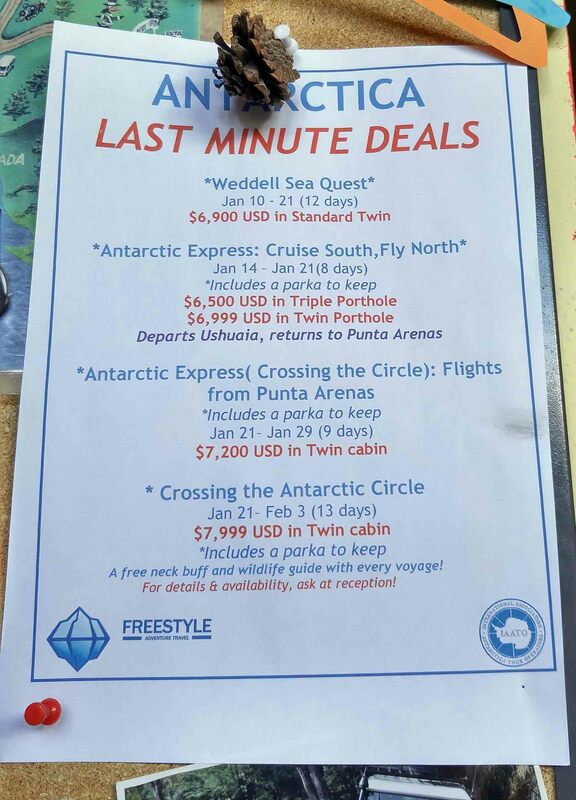 I really want to do a cruise to Antartica, but for some reason, I definitely thought it was around the $1k range. OH WELL. This is really interesting and might come in handy. Pinning it! YES! I love this post! I’ve really been wanting to go to Antarctica lately but it is just so expensive and out of the way. Thanks for the tips! It’s definitely expensive and I had a hard time stomaching the cost – especially when the Canadian dollar is down compared to USD. But it was worth every penny and I’m glad I did it now before it got even more expensive! Thank you for the informative post! I have had my eye set for South Georgia for quite a while, but at the moment this is outside my budget, especially since we travel together with my husband. But sounds like there are some options still out there 🙂 I would really like to take such a cruise with my husbands family, as they have two marine biologists in the family, so this would make the trip even more fun! This reminded me that we had a girl in my country who collected donations to do this a cruise, just by saying she really “wanted to”. Caused a lot of controversy when she did it, and a lot of discussion if its just a wish and not a need, one should pay themselves. Oh that would be amazing to have two experts on hand along the way – even seeing their passion for marine animals and ecology would be cool to witness to. It’s an expensive trip but so worth it! And props to the little girl – if she asked and people gave freely then smart on her part! It’s awesome that you were able to find such a good deal! I don’t think I’m brave enough to wait until the last minute to book haha, but this is a great guide for those who are! I’m going to check out your other Antarctica posts since it’s at the top of my bucket list! Thanks! I didn’t do the last minute deal as I already had one booked but it was so worth it to save such huge amounts of money!